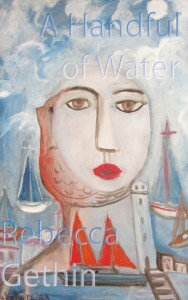 Today I’m delighted to welcome to my blog, Rebecca Gethin, whose second collection A Handful of Water, has just been published by Cinnamon Press. I enjoyed reading this so much that I asked our mutual publisher, Jan, to put me in touch with Becky so I could ask her a few questions. Becky lives on Dartmoor. Her first collection, River is the Plural of Rain, was published by Oversteps Books in 2009. Her novel Liar Dice was the winner of the Cinnamon Press Novel Award 2010 and was published in 2011. Your poems cover a range of topics, the first world war, the lives of contemporary prisoners and the natural world so do you consciously look for subjects for poems or do the poems come to you? In short what inspires you? I think ideas for poems come to me. I find them as one would notice an interesting pebble on a beach or an insect one hadn’t seen before. I never consciously look for subjects: it’s just a feeling or a thought that comes over me in odd moments often while doing something else (i.e. not writing). I remember Don Paterson saying at a poetry reading “Whenever you think you think that that would make a good poem, it won’t.” Well, I have lots of those. Usually any poem is sparked by just a small idea or a single phrase or a feeling and I just write about what presents itself to my mind. I carry a notebook in my jacket pocket and try to keep one beside my bed. I forget lots of so-called “good ideas” so that might be a good thing! You see I have this almost –permanent feeling that I must pay attention carefully or I might miss important things. If only I were less busy, impatient or grouchy and were more perspicacious and empathetic I would be able to notice things more clearly. How long did it take you to put together this second collection. How did you decide upon the order of poems and were there any which had to be left out? A Handful of Water took me years. I have found that I do need time .... not many of my poems are written under pressure and in a short space. And, in the end, lots of poems were inevitably left out. I’ve heard some poets keep themed files and when they complete a poem they decide which file to put it in so they are at work maybe on various collections at any one time. I admire that hugely. I found the order of this book extremely difficult at first and wanted someone to come to my rescue and find the golden thread running through the dog-eared pieces of paper. Until I realised, with horror, the only person who could do that was me, and that there was no golden thread except that of my own psyche. I wondered and wondered what should go in and what shouldn’t. The bundle of poems I had stored away seemed to have become a sort of closely-packed forest and eventually I saw that there were all sorts of interconnections between the poems’ roots, twigs and branches. I hadn’t been able to see this till I entered the job of trying to make them into a collection: couldn’t see the wood for the trees perhaps? I approached this particular task with A Handful of Water as though I were taking a walk over terrain where there was no visible path between the trees and I could only make progress by putting one foot in front of the other and hoping the next foothold would present itself – looking for something, (image, atmosphere, the underlying feeling) that linked one poem to another. A Handful of Water thus made, emerged as a rather different creature – more edgey and nerved – than the pile of paper from which it emerged. There is one poem in particular which intrigued me and that was All at Sea i.m. John Hasemore 1893-1916. Could you tell me more about him and how you came to write the poem? I am very interested in how to write political poems, especially poems about experiences like war when I haven’t been there myself. I was researching for a character who is a conscientious objector during World War One for my next novel (called What the horses heard) in the Quaker Library in Euston. I read about John Hasemore there and his plight captured my imagination. I wanted to write it as starkly and unemotionally as possible. So I am glad you were intrigued by that poem. It really happened like that and his court martial was indeed transcribed in pencil. I used the exact words he gave as his futile defence. Reading about people with scruples against the War in that library was an eye-opener. Those shelves were full of poems I could’ve written. (For your information, the poem called Tribunal was read out by the Peace Pledge Union at their Armistice ceremony in Bradford a couple of years ago and I felt very honoured.) But not all the World War One poems do come from there.... for instance, I found going to the Somme battlefields a terrible shock. And the plaque to a young man in our church says so much by saying so little. with its smells of stored apples, potatoes in a sack. And my final question is about an issue that many of us wrestle with. What are your strategies for making the time to write? Refining as much as possible the art of “No-can –do”..... ruthlessly. Thanks, Caroline, for doing this interview with Becky. I ordered your new book last week and am anxiously awaiting its arrival. What you're doing with political/war poems is important. The end of "Tribunal" is very effective! I thoroughly enjoyed doing the interview. It's great to get the chance to ask another poet questions. You will have a bit of a wait for Convoy as it's not due to be published until May.